Security and environmental sustainability remain top-of-mind questions for Canadian businesses. The great thing about standards is that there are so many of them. There are standards for just about anything. Early in my days as an engineer a colleague of mine was looking describe the specifications for the newly released CD-ROM drives for PCs. He ordered what he thought was the right standard from ISO and got something entirely different. Mind you, it didn’t stop company reps from claiming full compliance when we asked them about their new systems. In another case, I called upon full DOD-STD-2167A compliance for a standard computer software project back in the day only to find that the cost ballooned far beyond expectations (almost as bad as some of the other over-specified common every day products.) Thankfully, someone took the time and walked me through the standard I had casually referenced and pointed out all the processes, documentation, reviews and attestations that I had invoked for my relatively small project. Lesson learned, I started reading standards and specifications to understand all the mandatory, optional, normative, informative and other nuances found within. I liked it so much that over the years I also contributed to a few including: ACP, DOD, IETF, ISO, TBS and others. Standards are great since they help make things work as expected. For example, they help make sure that when you plug in an electrical appliance, so that it safely performs as expected. While standards frequently help things work, sometimes different interpretations or optional functionality within standards can prevent stuff from working properly together. That’s just one reason why it’s super important to know what parts of the standard are important to you and what parts are not so important. There are several others reasons too, including perhaps the most important one: cost. Yes it can be a pain to have to wade through what can be hundreds of requirements, but ultimately simply pointing to a specification number is entirely unhelpful. Technology seems to be evolving more rapidly than ever before and sometimes the speed of innovation outpaces existing standards. New approaches for meeting requirements can create discord with the existing standardized status quo. That’s when it becomes even more important to understand those details behind that specification or compliance standard number. Maybe that new capability makes a number of requirements obsolete, or perhaps far exceeds the tolerances of days gone by. Organizations, and the people using specifications to help their organizations, owe it to themselves to build out a comprehensive understanding of the specifications they are using and the rationale behind asking for them. Perhaps it’s the pace of change, but recently I’ve also seen an increasing number of people ask about non-existing certifications or ask about compliance against standards that don’t apply to a particular scenario. While not quite as egregious as the ISO Open Cold Storage of Cabbage standard I pointed to above (you saw that, right? ), they are unfortunate none-the-less. Calling out standards that don’t apply to your type of business or regions where you operate can create a drag on your business that you just don’t need. So before you cite a standard or specification, take a moment to ask yourself what particular parts of the standard are most important to your business so that you can be sure that the solutions you specify do everything you expect them to. By the way, sometimes people might simply call out an arcane standard with the hopes of cutting a meeting short by stumping the supplier sitting across from them. You’d never do that, right? Sometimes those expensive safeguards might not be giving you the big benefit you expect. Often the biggest impact can come from the low cost tools. Have a look at what I mean in this video. With the NBA All-Star game weekend behind us in Toronto (and that unusual anthem brouhaha), the battle between Uber and Taxis in the city will go quite until the next flare up. Cities around the world are wrestling with the policy question of how they manage ride sharing and taxi services. While debate about how to smooth the introduction of ridesharing in an existing (yet broken) taxi marketplace is required, policy makers need to look to incredibly close future where there is no longer a driver behind the wheel. We are already seeing trials of driverless taxis in Japan, seen long-haul trucks of the future, Local delivery vehicles and even air mules. Disruptions in transportation technologies are palpably close, but the policy foundation seems to be lagging a little behind. Some of the considerations are longer term, such as “What new jobs will replace those professional driver jobs?” Others are more immediate, “Do we create special lanes for driverless cars?” Let’s make sure our policy/rule makers are beginning to think about these things so that we can avoid as many unintended consequences as possible. Singapore: While the members of the Singapore Ferrari Owners’ Club won’t be happy, I would expect Singapore to be top of the list. Given its history of intelligent transportation systems and ability to execute, they would be a geo to watch. Tokyo – I’m thinking that the smart taxis and the social acceptance of new technologies would place this city at the top of the list as well. Amsterdam – This city is perhaps a bit of an outlier, but my thinking here is all about environmental sustainability and their success in moving people out of their cars by being one of the most cycle friendly cities in the world. Of course that doesn’t mean other cities aren’t going to see connected vehicles and driverless cars (see Ann Arbor and even Stratford) It just means that other cities will probably need to take a less dramatic approach and set aside lanes or routes in place of outright prohibitions. What do you think the biggest policy question for driverless cars will be? Ok, so I admit I have a bit of a soapbox around word finds, math quizzes, fuzzy puppies on social media. Lately these seemingly innocent diversions have shifted to troublesome requests. Requests that may put you at risk. We all remember the study in the UK where people provided detailed info in return for piece of chocolate. Are we doing the same for less return? These seemingly innocent quizzes may on the surface seem like a fun reminiscence, but what happens if someone trawls these answers and links them to your email address. You might say it’s not a big deal, until you recall those password recovery questions you’ve used. Since the development of recovery questions can be difficult, we keep seeing the same questi0ns come up time and time again: What’s your favourite movie, your elementary school or your first pet appear as questions again and again. It’s a quick pivot to recover your password using the answers you’ve shared. And while we’re on the subject of fraud, let’s also put an end to the “Likes Fraud” that’s creeping in as well. I know y0u’ve seen Colby’s post. Of course no one would think not to like a message like that (at this time over 962K people liked it on FB) and now it’s on Linkedin making it’s rounds every week or so from someone else, each getting ~5K likes. Since it’s been over 5 years since the “Economics of the Cloud” whitepaper was published, it’s time that we dust off that copy that’s been sitting at the bottom of our documents folder. No doubt there are a few people that are “new to cloud” and might not be aware of this gem and there are a few people that certainly can be reminded of its content as they build new custom IT projects. I’ve worked on a wide variety of cloud initiatives over the past 5 years and seen the supply side economics first hand. For one initiative, I contacted suppliers of containerized data centres to purchase 10 containers. I was a little taken aback that I could only be offered retail pricing for a quantity so small. It was the same story for energy and also for floor space. Operations and management also faced the same challenge, with every customization adding not only additional costs, but also introducing release drag by introducing new dependencies that needed to be considered with every release. Organizations are building out business cases for their move to the cloud and they include a variety of elements in their analysis. This generally includes all the traditional IT costs (hardware, licensing, personnel, floor space, energy costs). Often overlooked are the costs associated with supporting bespoke services/solutions. Creating organization specific documentation, training materials, education programs and configuration management should all factor in to the business case. Non-standard configurations and services also introduces delays in incident management since the external support organizations wont necessarily be familiar with your specialized deployment. Using standard public cloud approaches allows organizations to leverage the readily available training materials, standard templates and documents. So if you’re planning to build your own cloud or looking to cluster with organizations like your own to build a community cloud, it’s important to revisit the Economics of the Cloud paper to appreciate the dynamics of scale that drive hyper scale cloud. One of the fastest moving trends is that of ubiquitous computing or the “Internet of Things.” It’s a pretty exciting time and you’ve probably noticed from my presentations that I’m pretty jazzed about the opportunities that the Internet of Things represents. In the middle of last year, our 15 year old washer and drier were getting so noisy that they were almost calling out to be replaced. While we thought our previous laundry pair was futuristic with the stain brain touchscreen, we didn’t realize how much the world has changed. 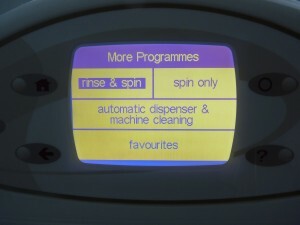 In addition to the larger capacities, energy efficiency ratings and great new functions, the technologies that they employ have advanced to make the chore of doing laundry as easy as it possibly can be. So when we looked at replacing our noisy pair, getting units with touch screen controls was a high priority. Samsung had just what we were looking for with a pair that uses touch screen controls. These machines even have WiFi connections so that you can control them from your smartphone. Sadly, they still don’t collect your laundry, sort, fill the washer nor fold it when it done. That said, they are pretty good at getting your clothes clean. Until… Until I noticed this little sticker on the front of the washer. 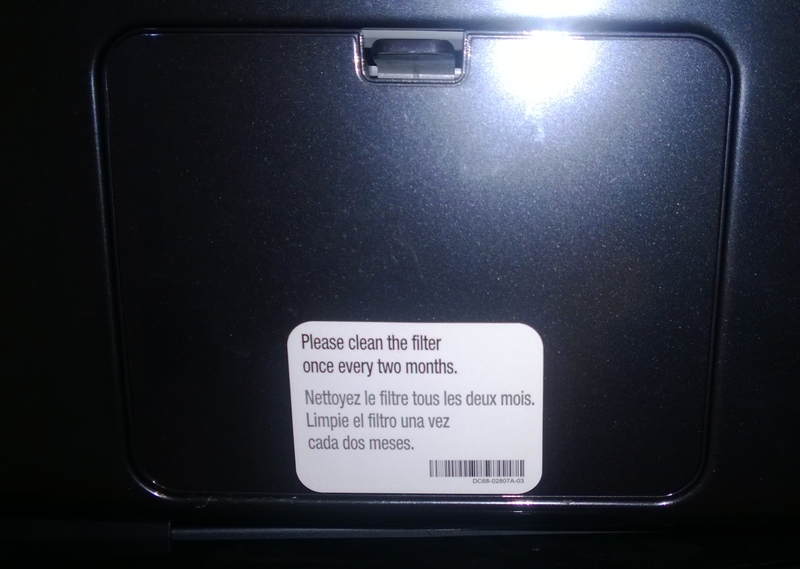 “Please clean the filter once every two months” – OK, I guess I better do that. 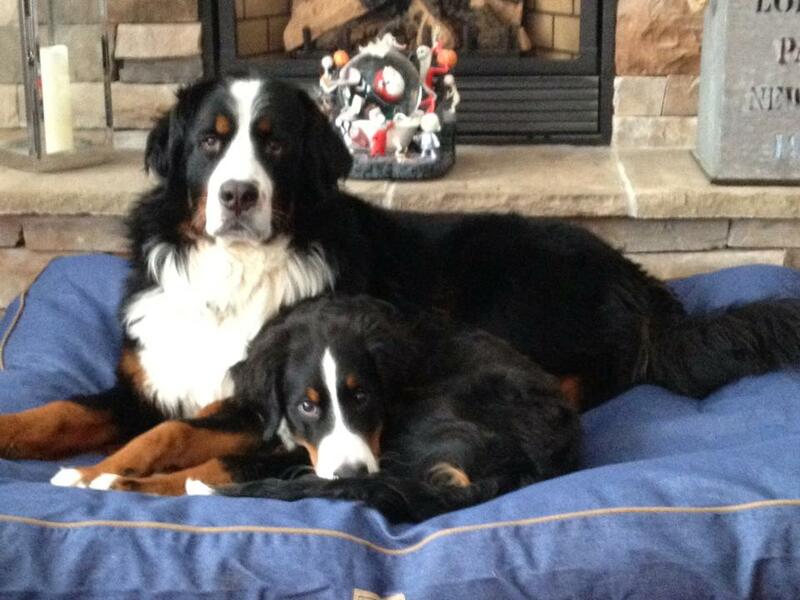 With two Bernese Mountain Dogs and gals with long hair, the last thing I want is a hairball gumming up the works. There’s a little round plug behind this little door that you turn and pull out. So I got out a 10 inch bowl, placed it in the drawer underneath the plug and removed the cylindrical filter. Gosh, water went everywhere. In the bowl, in the drawer, along the bottom sill and ultimately on the floor. I quickly cleaned the filter screen, replaced the plug and got the paper towels. I dried the drawer, dried the floor and everything else that got wet. And I dried it again, and again and again. Who had that great idea? Open a filter and soak your laundry room with the water that’s left after you’re done washing a load. While I was prepared with a large container, how many people would think of that? But the water doesn’t come out evenly. It flows everywhere. Now an engineer that occasionally does laundry might realize that they might want to direct the water someplace. They might realize that even if the water goes everywhere, it might be an idea to have the water collected in the plastic drawer stay there and not flow out and under the appliances. It leads me to believe that the engineers who worked on the filter had never actually used it and experienced the mess that results. Samsung engineers must not do laundry. It leads me to the mission statement that I have on my blog: “Using technology in the right place, in the right way at the right time.” I’m reminded of the electric drill that inspired my engineering journey. You see, this drill has a little red LED that would blink when you were getting the energy boost to power through and finish boring that hole. Living in Canada and doing my fair share of renovations in the freezing cold, I was reminded that when I am using a drill in -40 temperatures, I simply want it to drill that hole. I want the drill to work after it falls off the ladder for the third time. It struck me that the LED and the energy boost were features that really didn’t add anything useful to this power tool and might actually take away some of the expected utility. The messy filter serves as a reminder to engineers and designers everywhere. It reminds them to remember the primary purpose of the thing that they are working on. The coffee maker needs to be a coffee maker first and be connected second. The refrigerator should probably keep food cold before it tweets the status of the eggs. The light bulb might need to illuminate the room in addition to having its colour adjusted from your smartphone. As we seize the opportunities though the internet of things, let’s make sure we remember the primary purpose of those items we’re working with and make them better by connecting them.